"Like much of America's architecture, the Federal (or Federalist) style has its roots in the British Isles. Two Scottish brothers named Adam adapted the pragmatic Georgian style, adding swags, garlands, urns, and other delicate details. In the American colonies, homes and public buildings also took on graceful airs. Inspired by the work of the Adam brothers and also by the great temples of ancient Greece and Rome, Americans began to build homes with Palladian windows, circular or elliptical windows, recessed wall arches, and oval-shaped rooms. This new Federal style became associated with America's evolving national identity. It's easy to confuse Federalist architecture with the earlier Georgian Colonial style. The difference is in the details: While Georgian homes are square and angular, a Federal style building is more likely to have curved lines and decorative flourishes. Federalist architecture was the favored style in the United States from about 1780 until the 1830s. However, Federalist details are often incorporated into modern American homes. Look past the vinyl siding, and you may see a fanlight or the elegant arch of a Palladian window. " Capt Ebenezer “Rattler” Morgan House, 1851—Capt Morgan lived here until about 1865 when he completed the most profitable whaling voyage of his time, profiting more than $100,000 in 14 months. He appears to have acquired the nickname “Rattler” because of his rapid speech and rattling good stories that he could tell. 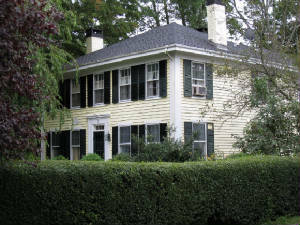 This house was built for him by Elisha M. Miner, a Groton Bank architect and builder. After his profitable whaling voyage he moved to a much larger house a block away, pictured in the section on Italianate architecture.